The call came in the middle of the NCPA Board meeting just as the NCPA Annual Convention in Boston was about to start. We were getting ready to start what would turn out to be one of the best meetings of the year for independent pharmacy owners. Great attendance, high energy, and lots of ideas being shared to make pharmacies stronger – I remember anxiously awaiting to kick things off for what I hoped would be one of our best meetings ever. The call I got made it even better. 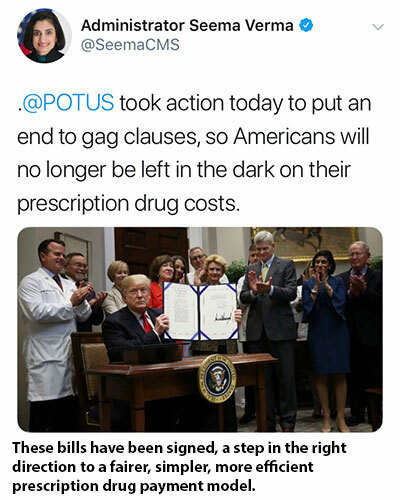 The call was an invitation to the White House to be present as President Trump signed the pharmacy "gag clause" bill legislation. It didn't take long to say yes. 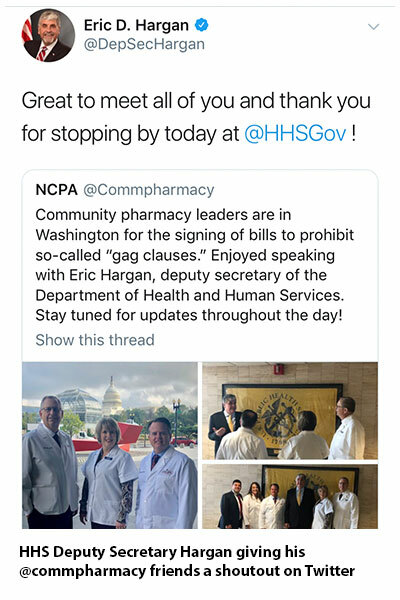 Gag clauses are one of the most nefarious ways in which PBMs try to muzzle community pharmacists from using their unique expertise to lower patients' prescription drug costs. 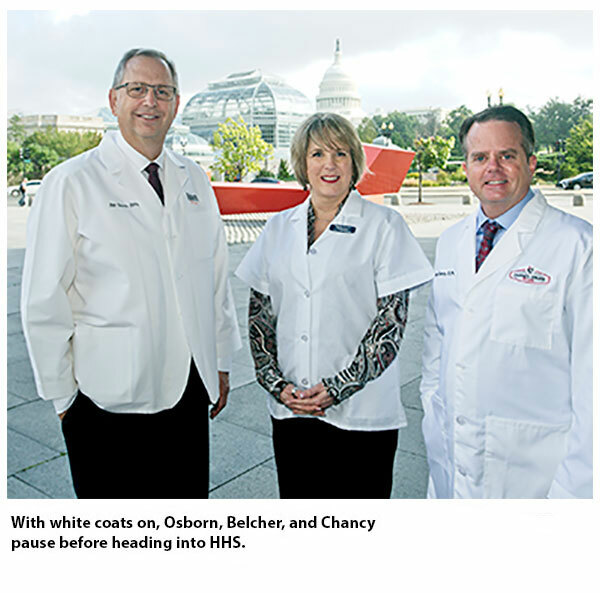 The chance to witness the signing, to have a front row seat as our efforts on behalf of community pharmacists were being recognized – this time at the highest level in government, to celebrate this win at the White House ... this was a great honor. And hearing the president again call out the "middlemen" as part of the problem was the cherry on top of the sundae. It shows that community pharmacists are being recognized as the only providers who are both medication experts and experts on the costs of those medications. These bills unshackle pharmacists from being able to use these unique talents to help lower prescription drug costs. The two bills signed by the president are S. 2553, the Know the Lowest Price Act of 2018, and S. 2554, the Patient Right to Know Drug Prices Act, which give community pharmacists more flexibility in informing patients they could pay less out of pocket for a prescription than by using their health insurance. We've designed a tip sheet to explain the new law thoroughly. 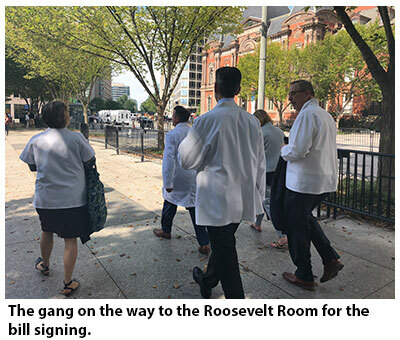 Watching as these bills were signed into law was the result of years of advocacy on issues affecting community pharmacy – finding pharmacy advocates in Congress, shepherding the bills as they picked up support. And as we talked to legislators about these PBM shenanigans, it's opened the door for conversations about DIR fees and other issues. It's a definite win for pharmacy, but most important, it's a win for the patients we serve. I stood behind the president as he signed the bills, along with NCPA's just-installed new president Bill Osborn, and NCPA Board Chair Michele Belcher and Board member Hugh Chancy, both of whom have worked hard to advocate for this legislation. In fact, last month, Hugh testified before the Energy and Commerce's Health Subcommittee on this very issue. 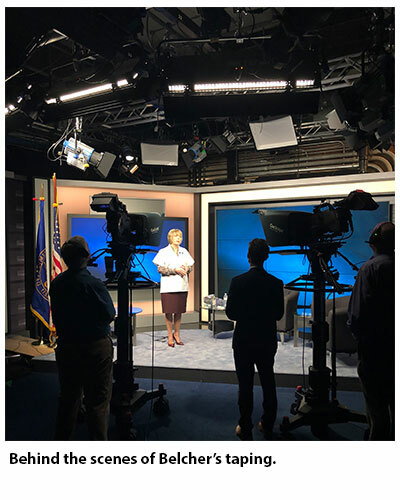 Bill, Michele, and Hugh were also asked by Health and Human Services to record some videos to help pharmacists understand what the bills do. They recorded them Wednesday at HHS before heading to the White House. You'll be seeing those soon. Among some of the notable political celebrities with us in the Roosevelt Room were HHS Administrator Seema Verma, HHS Secretary Alex Azar, Kellyanne Conway, Larry Kudlow, and the only pharmacist in Congress, Rep. Buddy Carter (R-Ga.), who the president singled out for his hard work on this legislation. Sens. Susan Collins (R-Maine), Lamar Alexander (R-Tenn.), Bill Cassidy (R-La. ), and Debbie Stabenow (D-Mich.) were more prominent attendees. These bills are a good first step in the right direction, but just one of many that are much needed to streamline the prescription drug payment model and make it fairer, simpler, and more efficient. We've got more work, but let's take a little time to savor this win. P.S. I can't close without mentioning another celebration: Today is the first Women Pharmacist Day, founded by the Pharmacist Moms Group to recognize the thousands of women who make a difference in patients' lives every day. More than half of today's pharmacist workforce are women, and many of those are leaders and mentors in our organization. Click here for respurces to help you spread the news today.